Striker Mark Cullen remains a Luton Town player for the time being after boss John Still confirmed the club hadn’t accepted an offer from an un-named team for him. 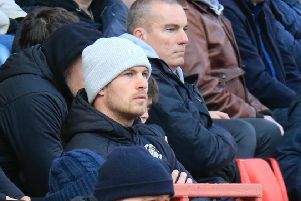 Cullen, who was left out from Saturday’s trip to AFC Wimbledon, has been the subject of persistent interest since before the transfer window closed. An offer has been made for his services, but it hasn’t met the Hatters’ requirements as speaking to the press this afternoon, Still said: “It’s an offer the club doesn’t think is acceptable. As far as the club’s concerned, we never made Mark available, they want him. “It’s different if you make them available and want them to go, you perhaps negotiate. But the club had a clear stance on where they felt the value was and that’s not been met. “Since then there has been dialogue between the two clubs, but nothing that has really changed the minds of us. “The club doesn’t feel the offer is quite right, we had a meet with Mark and said we’d leave that door open until Friday. “If something happens between now and then, we’d see where it led. Today’s Thursday, there’s nothing that’s happened that would change our mind or the club that’s interested in him that’s changed their mind. “So it’s a bit of a status quo. Having spoken to Mark he wanted to make it clear that the opportunity to speak to another club was something that he would take, but fully understands our situation. Still was also keen to point out that although Cullen had requested to talk the to club interested in him, he has never stated he wouldn’t play for the Hatters again. He continued: “I think it’s important I put the record straight a little bit as well. “There was interest in Mark from a club that made an offer, that we didn’t think was the right offer, just leading up to that period around the transfer window. “There have been others who have shown interest but not bid. The player’s agent knew, so we assumed that Mark would know, but it wasn’t what we felt was the value. “It went on a bit culminating in us talking with Mark and this is where I have to be clear on this. “I have a policy where if people don’t want to play for you, that’s fine, I don’t have an issue with that. “I always say, what do you want to do? Do you want to stay here? Or do you want to go? simple as that. “Mark’s answer at the time was if the opportunity came to go, he would. So in my mind, he’s maybe not going to be right for us. “Subsequent talks between us have been, he wasn’t saying he didn’t want to play for Luton, what he was saying was that if there was something there, he feels he should explore that and make his mind up. “But he never actually said he doesn’t want to play for Luton, just see where the other thing would lead. “Tomorrow I’m due to have a chat with Mark and then gauge really how he feels about the situation. “Situations change for everyone, so I’ll judge it when I speak to him. The boss had said on Saturday thatit was highly unlikely Cullen would feature for Luton again if a move away failed to materialise, but that may not be the case now. When asked if Cullen could play against Accrington on Saturday, he added: “The short answer to that is I don’t know. “I didn’t use him last Saturday because having spoken to him, Mark might say he was, but I didn’t feel that he was right.